I had so much fun making this list!! 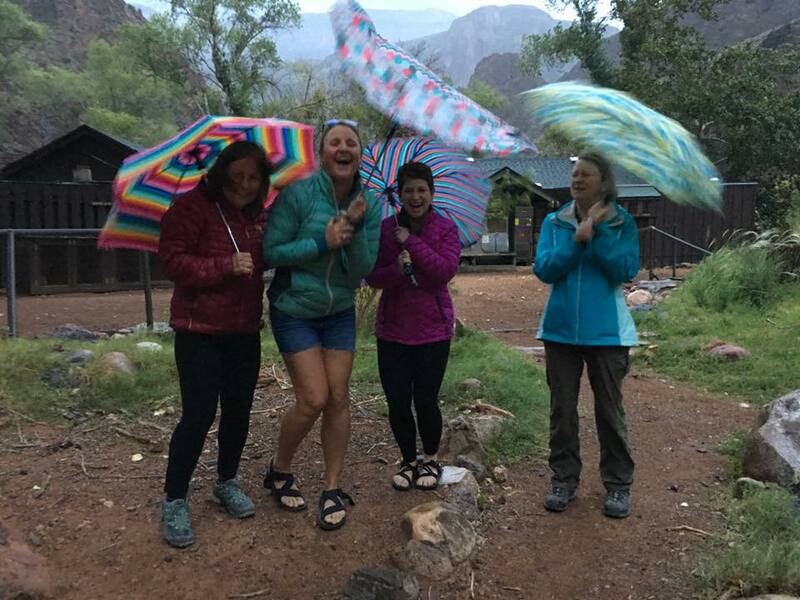 It is made up of the wisdom of our guide, the silly of the group I took down to Phantom Ranch and the knowledge of the amazing people we met along the way. This was the first year for “A Journey To The Unlimited Self” Elevate Excursion to Phantom Ranch in The Grand Canyon & Sedona. We hike 70+ miles in the 8 days of travel and I taught tangible tools to create a truly unlimited life. We kicked off the trip hiking to Phantom Ranch. It was truly was magical. There is so much more to the area than I realized and I’m excited to continue taking groups down into the expansive Grand canyon where life opens up and becomes UNLIMITED. 1. You should be able to do 30 minutes of stadium stairs with a backpack on before hiking the trail to Phantom Ranch. This is a great indicator of the success you will have. Don’t go unless you can do this. 2. It is extremely difficult to get reservations at Phantom Ranch. If you are lucky enough to get them or have the opportunity to go, DO NOT pass it up!! 3. Red Butte Mountain, a feature you will see on the drive to the South rim of the Grand Canyon is a sacred place for the Hopi & Havasupai Indians. The Hopi & Havasupai are just two of the many Indian tribes in the area. 4. Use hiking poles!! Don’t pass these up... unless you want to carry a watermelon!! 5. Mules can drink up to 8 gallons of water at a time!! Woah!! 6. The rock formations and mountains in the Grand Canyon are called buttes, temples, shrines, spires and castles. They are named after Gods of many different religions. Maps of these formations are available. 7. Drink lots of water. You should have 3 liters of water for the hike down and up. Drink all of it. Do NOT skimp on this. 8. The squirrels you see on the trail are called Kaibab Squirrels. This type of squirrel lives only in The Grand Canyon. Do not feed them. 10. Bagels hold up better than slices of bread for sandwiches on the trail. 11. There’s bats in The Grand Canyon!! 12. You can get a facial in The Colorado River using the exfoliating mud. It feels really good! 13. Bring your bathing suit. 14. Bright Angel Creek rocks! It makes the perfect post-hike bath. 15. You CAN widen the canyon & you will only find out how to do this on “A Journey To The Unlimited Self” Elevate Excursion. 16. You can get an exclusive IPA with the trail map leading to The Grand Canyon on it only at Phantom Ranch... and it’s good!! 17. You can dump 5 gallons of water in the toilet to make it flush. You have to hold it up high!! 18. Walt Disney spent time in Arizona & his idea for Mickey Mouse came from the cactus. 19. Barrel Cactus live right up in the canyon. Look them up!! 20. “Watch For Me On The Mountain,” is a story about Geronimo, a warrior of the Apache tribe and is a must read!! 21. Sedona got its name from Theodore Schnebly’s wife. Theodore was the city’s first postmaster. He tried to name the town Schneblyville, but got denied so many times. A friend suggested he use his wife’s beautiful name. So, he did. Good choice, buddy!! 22. It’s not my problem. Upon contemplating our UNLIMITED selves we realized others people’s issues generally are not our or your problem. 23. I learned the meaning of “further afield.” It means in places or areas other than the nearest or most obvious ones. 24. There is an inner canyon, middle Canyon, and upper canyon. Only 1% of the population that visits the Grand Canyon sees the inner canyon and that is where Phantom Ranch is located. 25. Picnic table yoga rocks!! 26. Bunk yoga is even better!! 27. Millers Limo is an upscale shuttle service from The Friedman Memorial Public Airport in Sun Valley, Idaho and someday I will fly in to be picked up by Don, the owner, with red carpet service!! You will too!! 28. Ring-tailed Cats eat from the fig trees at Phantom Ranch. They are nocturnal animals. 29. “The Emerald Mile” is another good book about the fastest boat road down the Colorado River. 30. In 1993, the Colorado River flooded. It moved at 100,000 cubic ft per second which can be compared to 100,000 basketballs going by every second. 31. You must have matching, colorful umbrellas. Warning!! This could induce uncontrollable laughter. 32. Phantom Ranch is at 2400 ft in elevation. It is a 4800 ft elevation climb to the South rim and 5800 ft to the North. 33. A treek is a mini creek flowing down a trail. 35. Plan for about 1 hour per mile hiking in The Grand Canyon. This way you can enjoy the views and the journey. 36. The California Condor, one of the rarest birds in the world, can now be seen at The Grand Canyon where it once did not exist because it was endangered. The world population now stands at 437 and about 70 live in Northern Arizona and Utah. Yay! These are HUGE birds with a wingspan of 9-10 feet, a lifespan of up to 60 years and can be up to 20lbs. 37. You may meet Crazy Bob on the trail. He often runs rim to rim. If you see him get a photo. 38. You should check out Travels with Angelica on YouTube. 39. Mountain House brand makes the most amazing oatmeal with loads of blueberries. 40. Bright Angel Trail was named by John Powell who was the first person to run Colorado River. He named many of the trails and buttes in The Grand Canyon. He had good experiences and bad while rafting the river. Coming upon Bright Angel Creek was a relief after experiencing Dirty Devil Creek where the crew’s food floated away. When they got to Bright Angel Creek there was Indian garden’s and clean water to drink. And so the name Bright Angel was born. 41. Having fun is the most important!! 42. The Grand Canyon is a great place to ponder your limitless potential. 43. Take plenty of rest stops. I recommend taking a water break each hour. 44. Corn nuts. That’s all. 45. It’s nice to help people along the way. 46. You can hire a mule to take your bag down and back. 48. The Ribbon Falls Hike is a must. It is about 12 miles round trip from Phantom Ranch and relatively flat. 49. Get the steak dinner, not the stew at Phantom Ranch. The veggie option looked good too and had a good report. 50. Come prepared for all weather conditions. It can be warm one second and chilly the next. Bring pants, shorts, long sleeve, short sleeve, rain jacket and a puffy warm jacket. Comfy pajamas are also a must so you can sleep snug as a bug in a rug. That way you will enjoy each moment of your trip.